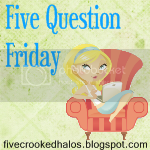 I thought I'd relax for a moment and participate in Five Question Friday. Something I haven't done in ages. 1. Would you rather be on ABC's Extreme Home MakeOver or TLC's What not to Wear? Honestly? Neither. I don't need a massive house that HM would create on our tiny lot and I've never seen What Not to Wear. But, I think it's that show where they basically tear apart your wardrobe. Am I right? Actually, I guess that wouldn't be so bad. 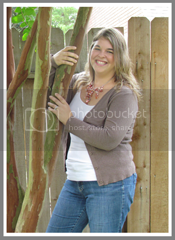 This Mama is is desperate need of some new duds! I do indeed. Two to be exact. One of the lower back (can we say tramp stamp? Ha ha!) and another on my hip. I'd like a third on the top of my foot, but I'm not sure if I'll ever get it. 3. Do you tell your kids about things you did growing up? Well, Aidan just turned one, so I don't think he'd understand what I was talking about. But, I'm sure as he gets older I will. I love hearing stories about my parents growing up! 4. If the traffic signal turns yellow, do you stop or speed up? Depends on if I'm in a hurry and if Aidan is in the car. With that being said, I only speed up when I'm by myself and rushing! 5. What's your preference: chocolate or chips? Um, both? I love chips and dips, salsa, queso, guacamole. Yum-o! But, I also have a little passion for things chocolate. Especially Dove dark chocolate almond candies. I always have them in a candy dish in our kitchen. Soooo good! Hope your visit with the sis was fun! Can't belive Aidan is 1! I remember seeing you pregnant not that long ago (or at least it feels like that). We need to talk soon!